It wasn't just hugs and a name sticker I received at the beginning of the retreat, there was an awesome goodie bag as well. It included some fab Robert Kaufman London themed fabrics, a Moda Petit Fours and various other sewing related goodies too (hello Aurifil Thread!). Also in the photo above some of the fabrics Carina gave me (she designed them herself, available at Spoonflower) and fabric I bought at the Tikki Patchwork shop on Friday. Sue Bone gave me the adorable pincushion. I won an American Jane Charm pack at the Raffle and (see yesterday's post) I also received a stack of Moda Petit Fours. Ok..back to the Retreat. In order to 'break the ice' we did a kind of name bingo game. This involved a lot of staring at unfamiliar bosoms as most women were wearing their tag at that height. ;) After that it was time to get stitching! Except for the fabrics and supplies I was told to bring to the Retreat (which varied depending on the classes you signed up for) I wasn't prepared at all for my classes. 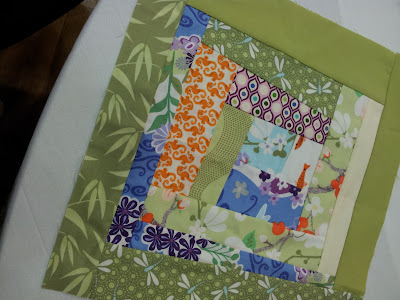 I had a vague idea that I would probably be ok with the Wonky Log Cabin Block class and the Purse class but I was a bit unsure about the Paper Piecing Classes. As it turned out I loved all the classes I did. Believe it or not, this took about 3 hours to make. Obviously it's not finished yet! Tacha (she was so lovely, I could have chatted with her for hours) taught me English Paper Piecing and I think I'm a convert now. It's a slow and precise process and perfect to take with you while you're on the go. I even did some on the Tube and plane home! It's kind of therapeutic too and I think it's something that some of you embroiderers will really enjoy. Tacha has a book out soon called Hexa-go-go you can find it for pre-order here. 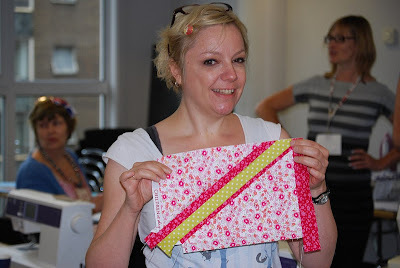 My next class was with John and was all about making a Wonky Log Cabin Block. John is a wonderful friendly guy and it was great to have finally met him in person. I was too shy to have a 'fan picture' taken of the both of us though, maybe next time ;) During the class I also got to have a peek in his Pretty in Patchwork Holidays book (I think it's out in August) which was especially nice because I have two projects in the book as well. I was a bit worried about using a sewing machine other than my own (I couldn't bring my own obviously) but I needn't have worried. The Pffaf Ambition 1.5 machines that were available to use at the Retreat were super easy to use and sewed like a dream. My Wonky Log Cabin Block came together quite nicely. I mixed some new fabrics (Kate Spain's Good Fortune) with some older fabrics from my stash (Heather Ross Mendocino and Tula Pink Parisville) John talked us through the process which is really 'design as you go along' and involves very little measuring (yay!) and as much wonkiness as you like. One thing I know for sure now is that I need a 12.5' square ruler which makes squaring up the blocks a breeze. Between classes I also got to a have a short chat with the very lovely Aneela Hoey. She was there to teach embroidery and I was glad to see that so many ladies attended her class. In the evening I went out for (fancy) burger and a well deserved (?) glass of wine with some lovely ladies from the retreat. Back at the venue we had a pub quiz but I think my team ended up in last place! After a night full of weird dreams about quilts and pub quizzes I arrived at the Baden-Powell house quite early, for my first class of the day, Paper Piecing with Lynne, started at 9. Lynne is a saint, she was so patient with me. I was totally confused about the whole process and kept on stalking her in class for about 2 and a half hours. Before the Retreat I thought I would be going home with a Union Jack pillow. After three hours I only had a quarter of a Union Jack Pillow but learned lots. My last class of the day was making a Purse with a frame with Katy. Somehow Katy and I didn't get to chat at all during those two days but I knew she was a wonderful person already and got to stare at her for a bit (she is really pretty) so all was well. Due to rescheduling me and two other Dutch peeps I was hanging out with (Linda and Muriel) missed about half of the class. I also knew I needed to get to the airport soon after so it was probably my least relaxed workshop of the retreat. But...I'm now totally convinced I can make these purses at home too. With a lot of help I managed to leave the Retreat with a nearly finished purse. In the pouring rain me and my suitcase made it to the Tube station and I arrived on the airport well in time before my flight was scheduled. While I was waiting at the airport I read (saw) on Instagram that the team that I was part of in the Iron Man challenge had won with this quilt top! Woot! I had a FANTASTIC weekend in London and loved every bit of it. I was a little nervous before the retreat about meeting all the people and traveling alone but it all went so well. I find it amazing that a large group of people with so many different personalities, different ages, different levels of sewing skills etc etc got along so brilliantly. We all shared our tools/machines and knowledge and clearly everyone was so happy to be there. So a big THANK YOU to the Fat Quarterly team and their helpers! It's impossible to mention all the people I met, chatted to, shared lunches and dinners and cutting mats with but you know who you are: thanks to all of you too and hopefully see you all again next year! I was finding myself doing much gazing at you from across the room as well because you're so pretty and cool. oh thank you! *bats eyelashes* I was a very nervous bunny during your class because I was too late and I hate being too late. And I pressed that scary 'sew automatic' button on the machine as well which resulted in my first swear word uttered at the retreat. I heard from others too that I look calm, confident and composed (the three C's, 4 if I include 'cool') but I don't always feel like I am any of those things! Definitely include 'C' number four, you are, without a doubt, cool. It was lovely to meet you and a mahoosive congratulations on the Iron Man Quilt win. It was lovely to meet you Nicole. I have to thank you again for my name badge - I had soooo much tag envy! Everyone loved it. I just found your blog and I'm very much enjoying it! The retreat sounds like lot of fun!